Francis went to Georgia on September 30, 2016, to celebrate a Mass that was supposed to indicate a new concord with the schismatic sect that dominates that former Soviet country. Several days before he traveled, Vatican Radio website was boasting that the so-called orthodox patriarchate had promised to send a delegation to the Mass “as a sign of the rapport between the two churches.” This was supposed to be a major step forward in dialogue. The next day, October 1, the seats at the Tbilisi sports stadium, which can accommodate 27,000 people, were empty. Embarrassingly so. Not even 3,000 persons were there to assist at the Mass, and this small turnout included groups of Baptists, Lutherans and Pentecostals. No explanation was offered for the low participation of Catholics, who number 110,000 in the country. When John Paul II went to Tbilisi in 1999, an estimated 10,000 people were at his one public Mass. Perhaps this time the optimistic Vatican organizers were saving the seats for the schismatics, who were, however, all no-shows. The diplomatic stands were also empty. Except for Georgian President Giorgi Margvelashvili, no prominent Georgian statesman was present for the Mass. With the parliamentary elections near on hand, politicians were apparently unwilling to alienate their largely schismatic voters by appearing at a papal ceremony. Outside the stadium, a protest was staged by a large group of schismatics led by black-cassocked dour-faced priests who vehemently oppose any ecumenical initiatives. They held signs written in English to make their message clear to the watching world. 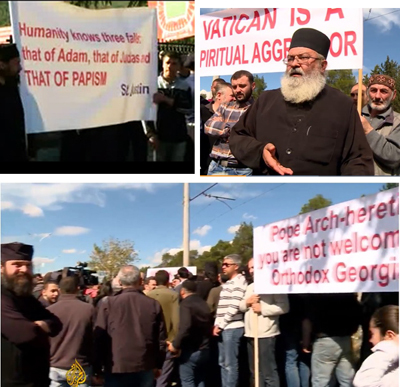 The placards read: The Vatican is a spiritual aggressor, Death of Papism, Pope Arch-heretic, You are not welcome in orthodox Georgia, Humanity knows three falls: that of Adam, that of Judas and that of Papism. The event was billed to be the first time in modern history that a delegation from the Gregorian Schismatic Church would participate in a papal Mass. It did not happen. 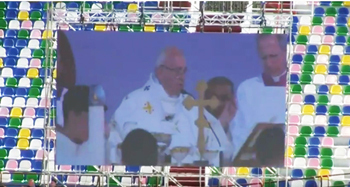 Instead, it was the smallest crowd ever seen at an outdoor papal Mass on Francis’ 16 foreign trips. It was a complete failure for Pope Bergoglio, who took on the same dour face as the schismatic priests. How did Francis respond to this blatant insult from the Schismatics? Yet more shameful words from Francis, incomprehensible to faithful Catholics and opposed to the prior Magisterium of the Holy Church. But Bergoglio was not finished shaming his office. That evening, after the schismatic patriarch had refused to assist at his Mass, the Pope led a Catholic delegation into the schismatic cathedral of Tblisi. There he bowed to patriarch Ilia, the two lit a candle together, listened to hymns sung in Aramaic and delivered speeches. 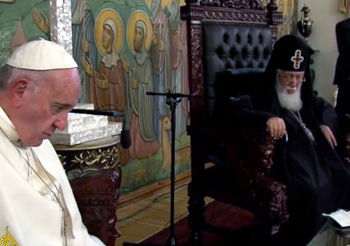 The patriarch, however, refused to pray with the willing Francis. Both men spoke of unity, but the tones were poles apart. Francis droned on and on for a unity based on “sincere charity and mutual understanding in a spirit of pure Christian fraternity.” And more such blah-blah-blah. The patriarch responded, however, demanding Catholics to bend to the schismatics: “Our unity is in the true faith and only the true faith is useful to humanity.” That is to say, the patriarch called the heresies promoted by the schismatics the "true faith." On Sunday, Francis left Georgia to visit neighboring Azerbaijan, which has fewer than 300 Catholics in its overwhelmingly Shiite Muslim population. In fact, Azerbaijan has only one parish, no bishop and seven priests and seven religious sisters total. Most of these Catholics are foreigners – diplomatic employees and oil workers. 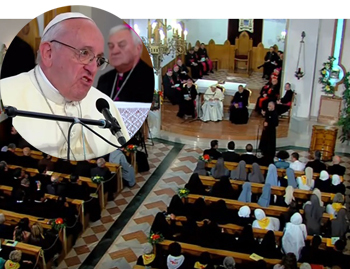 The real reason Francis went to Azerbaijan was not to pay homage to the “precious little flock” of Azerbaijan, all of whom he could have flown to Rome for less cost than his trip there. It was to meet with the region’s grand mufti Sheikh-ul-Islam at an “interfaith” encounter along with Jew and Schismatic representatives in the country’s largest mosque in Baku. To please the Muslims, Pope Bergoglio quoted a Sufi poet/philosopher, encouraged religious tolerance and approved the journey of each man to find “the Most High” the way he chooses. He ended his address with the typical cry “No more violence in the name of God!” – implying by this that “fanatics” of Catholicism are also guilty of such “crimes” against ecumenism. Except to praise and pray with the Muslims, what was the point of this 11-hour papal visit In Azerbaijan? 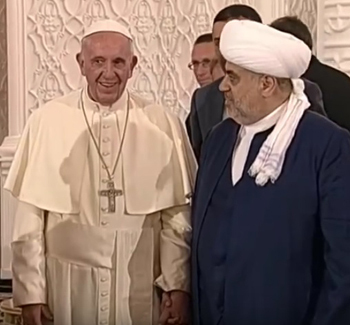 More one-sided ecumenism with the Muslims and moronic denial of the violence Muslims are wreaking in their invasion of Europe and the U.S..
On his plane trip back to Rome, Francis twisted the facts to fit his purposes. His failure in Georgia gave him two great surprises, he told reporters. One was to know the “great faith, culture and Christianity” of the schismatics who had snubbed him and protested against his presence. The second surprise was to know the patriarch who “is such a man of God.” This was his version of the insulting rebuff he had received. To turn the patroness of missionaries into a precursor of ecumenism, no longer interested in converting but only in serving members of false religions, shows how much Pope Bergoglio falsifies reality in order to deceive the faithful and advance the agenda of Progressivism. Will Luther Be the Next Canonized ‘Saint’?